To create more awareness globally Safemedtrip world class hospital in India has initiated a program on spreading awareness on hernia called as “Hernia Care”. Under the initiative of Senior Consultant Laparoscopic Surgeon, this special care program has been introduced to take care of all hernia related issues in women. He is MS, DNB, FRCS (Glasgow) – A renowned laparoscopic and bariatric surgeon with extensive experience. He has also performed 15,000 laparoscopic cholecystectomies with a single CBD transaction and four minor lateral injuries with zero conversion rates. This includes 135 cases of laparoscopic management of cholecystoduodenal fistulae. Further to this he has performed over 18,000 laparoscopic surgeries, which includes many complex procedures. He has performed very rare procedures such as Lap Whipple’s operation, Endoscopic neck surgery, VATS excision of mediastinal tumors, Open Pancreaticoduodenectomy, Laparoscopic removal of huge retro-colic cyst, Lap excision of choledochal cyst, Lap total proctocolectomy for ulcerative colitis, Lap removal of huge mesenteric cyst extending from liver to pouch, Lap revision cholecystectomies, and revision CBD explorations. Hernia is more common with men and a lesser known fact is that large number women are victim to this disease called Hernia because of the issues peculiar to the gender, and specifically the reproductive function of women. A Hernia is a protrusion of an organ or the fascia of an organ through the abdominal wall of the cavity that normally contains it. This noticeable bulge under skin and the pressure of the tissue pushing its way through the weakened area can be a source of significant pain and discomfort. Surgery is the best way out of it. 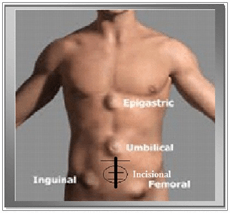 All hernias are not equal. There are different types of hernia like inguinal hernia, epigastric hernia, femoral hernia, internal hernia, hiatus hernia, incisional hernia and umbilical hernia. A simple surgery could relieve the problems of a lifetime. All it needs is awareness in the community and access to a world class Hernia Repair Center that cares to screen patients. Latest technology in the world to cure patients and ensure quick rehabilitation. Newer fixation devices and the ‘physiologic mesh’ that tends to cling on to the abdominal wall without the need for too much fixation. Tiny openings, each 1/4 to 1/2 inch in diameter, instead of the traditional 3- to 5-inch incision. In addition, with laparoscopic hernia repair, the mesh patch used to cover the abdominal defect is placed on the inside of the abdominal wall instead of the outside. This method works with the natural outward pressure of the abdomen to secure the repair and promote healing. Colorectal Cancer can be treated in India with most advanced Minimally Invasive Surgery.